As a Ohio car accident attorney dedicated to justice for injury victims for the last 32 years, I’ve met and heard from thousands of Ohio car accident victims and their families. · Do I need a car accident lawyer or should I try to settle my claim myself? · How much can I recover for damages to my car? · Can I use my car insurance to pay medical bills? · Should I give a recorded statement about my accident to the insurance company? · What kind of injury settlement can I expect after my car accident? · How long will it take to settle my claim? Will I need to go to court? · How much does it cost to hire an car accident attorney? These are exactly the sorts of topics we cover when you request your FREE Claim Evaluation. Save the time and hassle of getting the answers you need on your own. Simply call 1-800-447-6549 today to schedule your one-on-one, no-obligation session. Why should you wait any longer to know your best way to move forward? Discuss your situation with me for FREE by calling 1-800-447-6549 now for your no-cost Claim Evaluation. Ohio car accident victims and their families injured in Montgomery County owe it to themselves to get an experienced and dedicated Dayton car accident attorney on their side so that they can get seek full compensation they need and deserve. It may be hard for you to think about the next step during this very difficult time, but you need to get started right away. Otherwise you may miss out on the compensation which can pay for your medical bills, lost income, and future needs. Ask about his 5 Fundementals of Uncompromising Advocacy designed to maximize your recovery. After a car accident, the medical bills can be overwhelming, and all of your regular bills keep piling up. If you are not able to work you will need help to keep the creditors at bay and finding sources of income. We know that you cannot afford to take on another expense. Your no obligation initial consultation is free of charge. If we represent you, we work on a contingency fee basis. We will not ask you for a retainer or charge you hourly attorney’s fees. A contingency fee is contingent on recovery for you. In other words, if we do not win money for you, there is no fee. Car accident injuries typically involve ongoing expenses which injury victims and their loved ones do not fully anticipate or understand in the first days, weeks, or even months after the accident occurs. Because our Dayton car accident attorney Anthony Castelli has handled thousands of injury cases, he has seen first hand how the future can look in terms of long-term consequences. 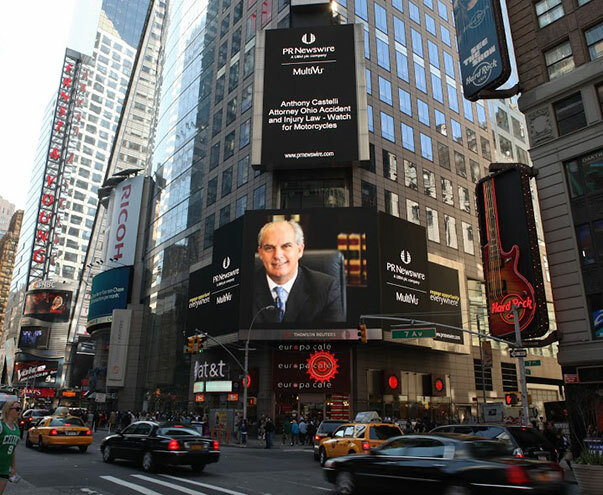 Anthony knows it is imperative to present a compelling case for full compensation. Anthony has the highest ratings given by established peer review companies. These are AVVO and Martindale Hubbel . Anthony is listed in Ohio Super Lawyers Magazine. 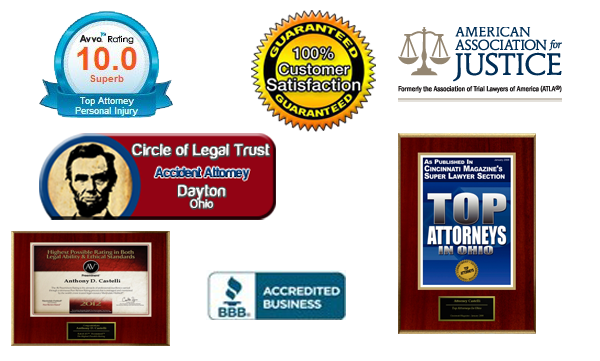 He has case results for you to review as well as client testimonials. He offers a 30 day guarantee to alleviate your fears about hirng a lawyer. If you are not satisfied within the first 30 days of hiring Anthony you can take you file with no fees and no questions asked. If you or a loved one has been injured or a family member has been killed in a car accident in Ohio, please call car accident attorney Anthony Castelli at 1-800-447-6549. Or submit an online questionnaire. Your initial consultation with Anthony, licensed in Ohio and practicing auto harm law in Dayton and throughout Ohio is free of charge. If he agrees to handle your case, he will work on a contingency fee basis, which means he gets paid for his services only if there is a monetary recovery of funds. In these cases, a lawsuit must be filed or settlement reached before an applicable expiration date, known as a statute of limitations. Please call right away to ensure that you do not waive your right to possible compensation and to get legal help now to guide you in the right direction. Nothing on this site is intended to imply that Anthony Castelli guarantees or can achieve a particular result for your case. Every case is different with multiple factors that go into a success or unsuccessful result. This website is for general information only about the law practice of Anthony Castelli, a lawyer licensed in Ohio, and does not constitute legal advice for your claim nor does use of this site or filling out a contact form constitute an attorney client relationship. There is also general educational inormation content. Legal advertising.